John was presented the award by Terry Warkentin, Fleet Sales Manager of Volvo Trucks Canada, during festivities at the Sheraton Vancouver Guildford Hotel in Surrey. As part of this honour, John received a trophy, cash prize and weekend getaway for two. Volvo Trucks Canada, renowned for its commitment to safety, sponsors both national and provincial Driver of the Year awards in recognition of the importance of safety in the trucking industry. Each year, a panel of judges made up of representatives from Transport Canada, the Traffic Industry Research Foundation, Canada Safety Council, the RCMP and the Canadian Trucking Alliance selects a national winner from among recipients of the Driver of the Year award in each province. The national winner is selected for excellence among peers who have maintained a collision-free driving record and otherwise demonstrated exemplary professionalism both on and off the road. 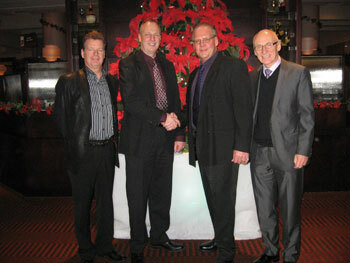 John Beeler was awarded the BC Driver of the Year award at BCTA’s annual Management Conference in June 2010. His commendable driving record has earned him many accolades from organizations including the National Safety Council, the RCMP and Canadian Freightways Ltd. Having completed many safety and operational courses, John now trains company drivers. He also offers his expertise to outside carriers by consulting on safety issues and has assisted authorities in collision investigations. John makes his home in Maple Ridge, BC, with his wife, Charmaine. In this photo: (left to right) David Bradley, CEO of the Canadian Trucking Alliance, Terry Warkentin, Fleet Sales Manager of Volvo Trucks Canada, John Beeler, Paul Landry, President & CEO, BCTA.